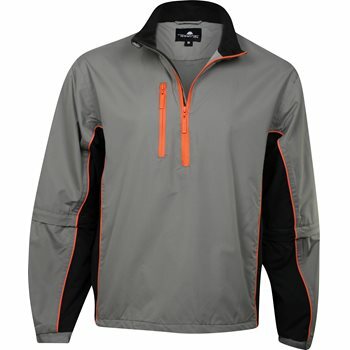 The Weather Company Microfiber ¼ Zip pullover windshirt is constructed of a 100% microfiber polyester shell and a 100% lightweight polyester lining. This comfortable pullover has zip away sleeves which easily convert to a short-sleeved pullover Other features include a waterproof finish with taped seams, inset chest pocket and two side pockets with zipper closure, elastic cuffs with Velcro closure, and adjustable draw cord with stoppers in waist hem. This versatile and stylish pullover is perfect for cooler days and looks great on and off the golf course.